About 20 hours into Mario and Luigi: Dream Team, the game stopped me to teach me how to use a skill I’ve been using since the beginning of the game. Then, it added a minor wrinkle to this ability, and stopped to teach me how to use that. Then, in the next room, it stopped me to talk about it one more time. This was 20 hours in, very close to the end of the game. I almost threw my 3DS across the room when in the very next room, the game stopped to teach me how to use this ability AGAIN. Mario and Luigi: Dream Team is not a bad game In fact, half of it is an excellent game. The other half of it is one of the most infuriating RPGs I’ve ever had the displeasure of sitting back and reading. Dream Team is not a half bad game; it’s a half good one. Even in Luigi's dreams, Mario is the one in charge. Dream Team is the fourth Mario game in the Mario and Luigi series of RPGs, one of two series spun out of Squaresoft’s Super Mario RPG: The Legend of the Seven Stars. 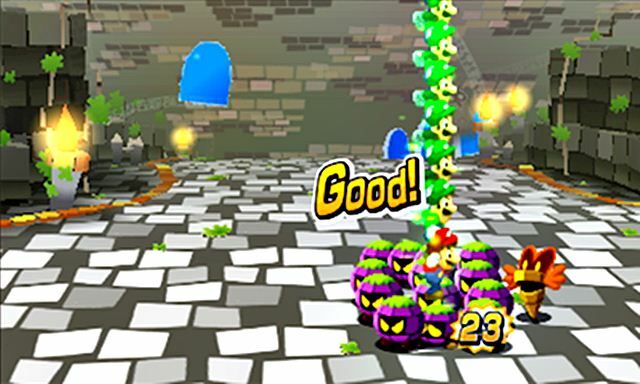 The Paper Mario series plays a little more like a Mario game, with a sidescrolling perspective in the overworld, and a very minor use of stats. The Mario and Luigi games are slightly more traditional in their RPG-ness, other than the fact that, like Mario RPG and Paper Mario, the game uses properly timed button presses during attacks to make them stronger. It’s a fantastic marriage of Mario’s action game roots to an RPG battle system, and turns the usual slog through turn-based battles into an exciting game of reading enemy tells, finding the timing to counterattack, and then perfecting the timing on your own attacks. This part of Dream Team, the combat half of the game, is spectacular. The game is loaded with plenty of interesting, challenging enemy attack patterns to learn, and boss fights start becoming a serious challenge pretty quickly. I found myself dying on bosses multiple times, just because they get so tricky. Fortunately, dying lets you just restart the current battle instead of having to go back to the title screen, which makes the challenge fun rather than brutally frustrating. Mario's helmet must me made of steel if it protects him from a dozen Luigis falling on him ever time he jumps. The frustrating part of the game is everything else. From the presentation to the dialog to the puzzles to the overworld, nothing else about this game works the way you’d hope it should. While the game has gorgeous spritework (I found myself obsessing over the tiny animation details, like Mario adjusting his cap after landing from a particularly high jump in battle), that level of detail isn’t matched by the music. There’s only one battle theme, one boss theme, and one tune for each area, and you hear them a lot. It gets incredibly grating very quickly. You can’t turn to the dialog to keep you entertained though, because while the localization staff tried their hardest to pump the exposition-laden script full of jokes, they just couldn’t keep up with amount of chattiness in this game. Characters rarely talk for a long period of time, but they do take a page out of Final Fantasy 13’s book and give you some exposition before making you walk across the room for another five minutes of their lecture on the history of this island you don’t care about. Those characters are sprites! Incredibly detailed sprites that look 3D! It's crazy! I don’t think there’s a single room where the game doesn’t wrest control of the camera away from you to highlight the solution to that room’s puzzle, and then has one of your two Navi-like companions pop out to wonder if what the camera just focused in on is the solution to a puzzle. And then when you solve this puzzle in 30 seconds because the answer was spelled out for you, they will fly out of Mario’s back pocket again to comment on how that WAS the solution and boy they’re sure proud you figured out that brain-buster. It’s a toothless exercise in going through the motions, exacerbated by the fact that it never just shuts the hell up and lets you enjoy the combat. Other than backtracking, there are no 10 minutes of playtime in this game that go uninterrupted by some NPC who will heavy-handedly reveal the solution to a puzzle, give you some exposition, then maybe manage to crack one cute joke. 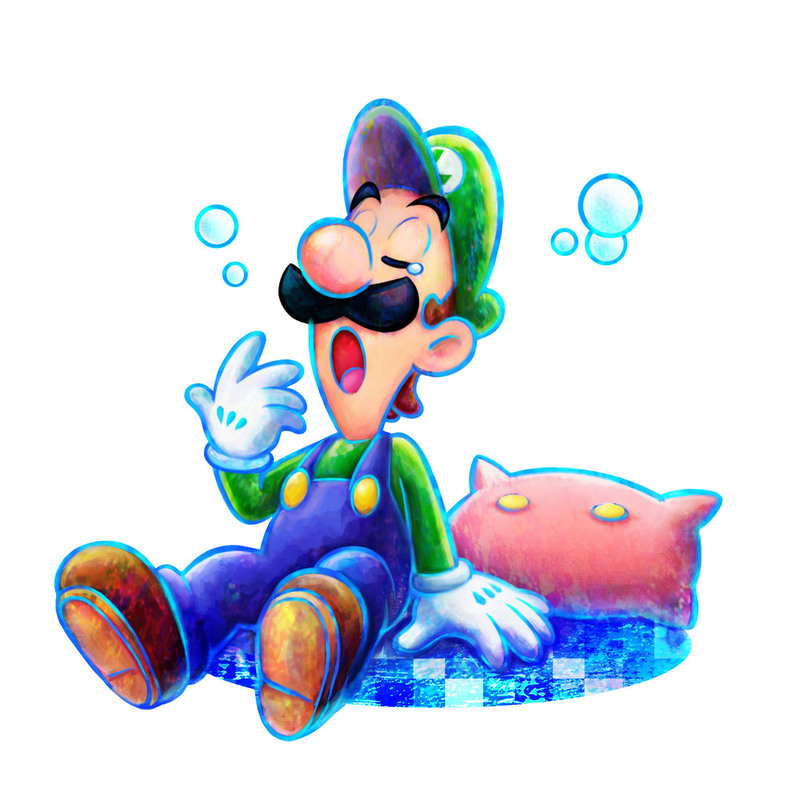 Maybe the constant exposition is why Luigi's able to fall asleep so easily? The localization staff deserves some real recognition for managing to punch up this script as much as they did. They tried to make as many jokes as they possibly could, but the sheer amount of text in this game must have overwhelmed them. 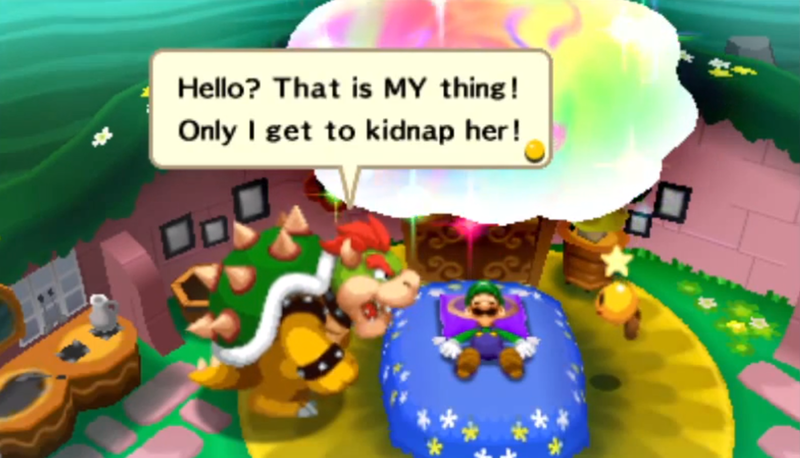 It’s a real shame, because the game’s predecessor, 2010’s Bowser’s Inside Story, managed to have a consistently punchy script all the way through. Mario and Luigi only had one tagalong “helper” to chat up tutorials, Bowser rampaged through exposition because he just wanted to break stuff, and the game’s villain, Fawful, spouted incomprehensible gibberish most of the time. It was great. Boswer’s Inside Story had the same structure as Dream Team too, with half the game taking place in a sidescrolling, platformer-lite world, and the other taking place in a more traditional, top down overworld. 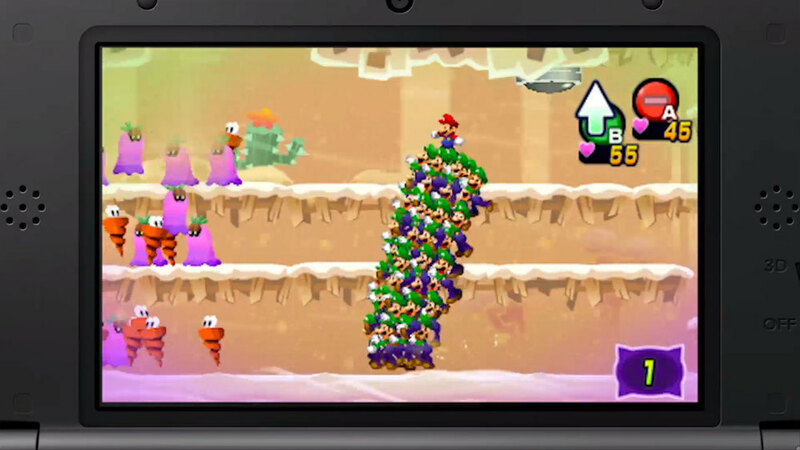 In this game however, instead of Mario and Luigi spelunking inside Bowser’s internal organs for the sidescrolling portions, Mario delves into the dreams of his ever-forgotten younger brother. In these dream worlds, Mario fights alone, with Luigi’s many dream selves acting as afterimages that power up his attacks. The battles also let you move up and down or face left and right with the circle pad when dodging certain attacks, which adds an appreciated level of extra depth to the combat. Ugh, gross Luigi, use a giant dream tornado tissue. But again, the combat is great. If it weren’t for the fact that playing as Bowser in the previous game was so fun, Dream Team would have the best combat in the series. It’s the constant hand holding and exposition that drives me up a wall. It almost feels like a reaction to last year’s Paper Mario: Sticker Star, which refused to hold your hand so much that it never even hinted at the solutions to the increasingly obtuse puzzles. Sticker Star hated holding your hand; it wanted nothing to do with it. Dream Team loves your hand, and wants to hold it so tight and never let go. It wants to take your hand and lead it to this item box, which it will make you stand under and show you how the A button makes you jump, 25 hours into the game. I can understand tutorials in games, they aren’t a big deal most of the time. Ten hours into Dream Team, I thought I was finally seeing the end of them. That’s a long time for a game, but the combat was so good that I was willing to accept it. And then they didn’t stop. They never stopped. Ever. Mario and Luigi: Dream Team is a half good game. The combat is the good half, everything else is the bad half. It’s a testament to how great the combat is that I want to recommend the game at all, but unless you’re jonesing for a new Mario and Luigi fix, I don’t know if anyone can make it past the constant hand-holding, exposition and tutorials. If you need to play it though, do yourself a favour and maybe do something else when everyone’s talking, you won’t miss much.